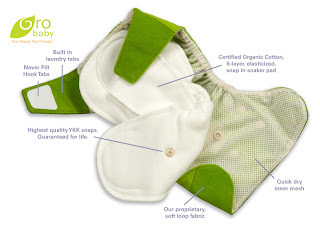 BumRite Cloth Diaper Company: Why Are Daycare Facilities Reluctant to use Cloth Diapers? Why Are Daycare Facilities Reluctant to use Cloth Diapers? I just met a great woman who would like to cloth diaper her baby, but works full time and her daycare provider refuses to use cloth diapers. Understandably, she cannot financially justify two sets of diapers. I think. I'll have to do a little math when I am finished writing (my mom is a CPA and I can't help the urge to always assemble financial models with ROI for important decisions). I don't understand why a daycare wouldn't accept cloth diapers. Perhaps they don't know how easy they are? GroBaby would be a perfect example of a daycare-friendly diaper. Simply bring a stash of 6-8 already snapped-in diapers to daycare with a wetbag. Or provide the compost-able bioinserts if they are really bent on throwing something away. They really are no different than disposables - except they don't get to shove them in the trash with the other diapers. Is it poop? Well, poop actually belongs in the toilet! Whether using disposable or cloth, the providers should be plopping solids in the potty, not the garbage and all wrapped up in a non-breathable, non-biodegradable hot plastic ball of chemical-laden plastic/paper. If you look closely on most disposable diaper packages, it mentions that requirement...in size 2 font. Am I biased? Yes! Is it an age thing? I suppose that it could be. The previous generation that now runs these day cares doesn't get how simple it is! No more toilet-dunking or wet pails. Simply put the soiled diaper in a bag and give back to the parent at the end of the day for washing. I would think it would be better than storing every kid's diapers packages, like I had to do at #1's daycare. Yes, I used disposables with #1. Simply because I didn't know any different. Perhaps that is the case here. Maybe I should visit all the local day cares/preschools and shamelessly promote my business? Yes - that it what I will do. I am a one-woman cloth diaper crusader in the Napa Valley. After all - who really wants to have poop run-off fertilizing their wine?! Can you imagine the Sommelier's notes: a full-bodied, earthly, sweet potato and apple-sauce scented wine with a touch of baby poop on the nose.....". The things I never thought about, that you have made me think about, are now troubling me... I'm pushing for potty-trained status asap. "Kiddo, it's better for the earth, for Napa Valley wine!" How are those potty training pants working?